There's a lot happening this week. We're heading to City Tap House to celebrate the start of West Philly Summer (Penn's semester is officially over), so we should have the place to ourselves! Then Thursday WPR is guest directing the Wissahickon Wanderer's Trail Race. And finally, Saturday is the 26 x 1mile Marathon Relay, the best race of the year. 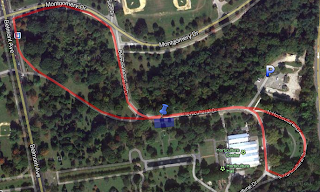 Wissahickon Wanderers Trail Race Series continues this Thursday. West Philly Runners will be the guest race directors for the race, so I'd love to have as many WPRs out there as possible! My trail route is going to be challenging, but really enjoyable and only about 3 miles! Meet at 6:30pm at Valley Green Inn. Julia will be driving folks up and others may also be driving. Check out the Facebook page for carpooling. 26 x 1 Mile Marathon Relay is this Saturday, May 18 at 10am!! Teams of runners will compete in a team marathon running 1 mile per runner. We'll set up at the Horticultural Center in West Fairmount Park. Here's a map! The event is pretty simple. We will have a set of teams compete, with one runner from each team running a mile loop at a time. Each team will complete 26 laps and finish off with a 0.2 mile sprint. Meanwhile, we'll be cooking, drinking, and generally enjoying a beautiful Saturday morning in the park. Bring a blanket and some brews (not a requirement, we'll provide some ourselves). This is generally a very low-key, relaxed event and we hope you can make it out.